GPU Caps Viewer 1.9.0 with OpenGL 4 tessellation demo is available HERE. A new update of GPU Caps Viewer is available. This new version adds the support of OpenGL 4.1 and improves the OpenCL support. 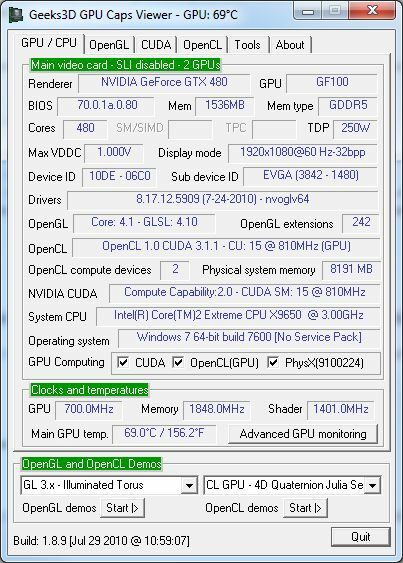 GPU Caps Viewer is an information utility focused on the OpenGL / OpenCL / CUDA API level support of the main graphics card. 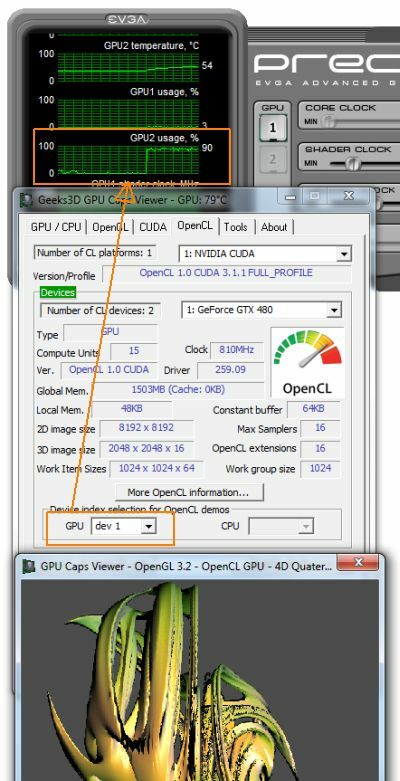 Even if you have several graphics cards in your system, only one is considered as the main OpenGL or Direct3D device. 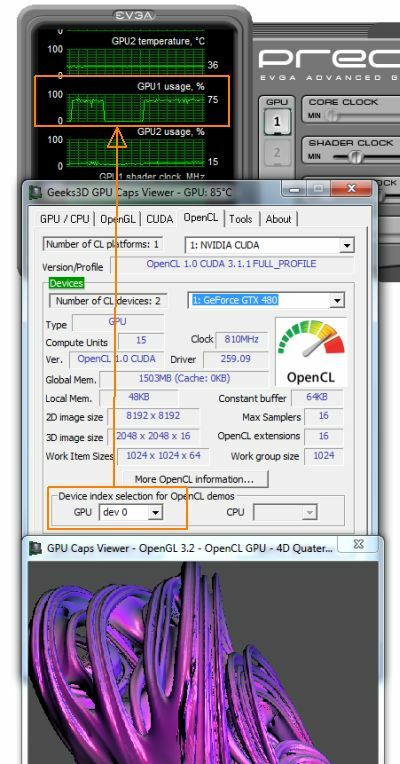 For OpenCL and CUDA, GPU Caps Viewer details the API support of each capable device. More information about GPU Caps Viewer can be found HERE. 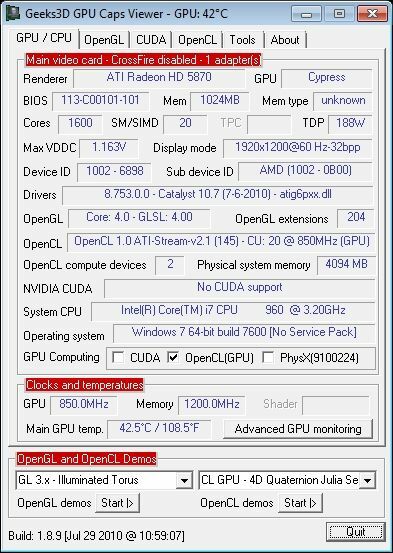 New: added in OpenCL panel, the selection of the current device index for the demos. New (PRO version only): a command line option allows to select the OpenCL device on which running the OpenCL kernels. This option is useful if you have several OpenCL capable GPUs. By default the first device is used (OpenCL device 0). The command line param is /cl_device_index=n where n ranges from 0 to # of GPU/CPU – 1. New: added NVIDIA Quadro 5000 to the database. Update: minor changes in OpenCL related code. 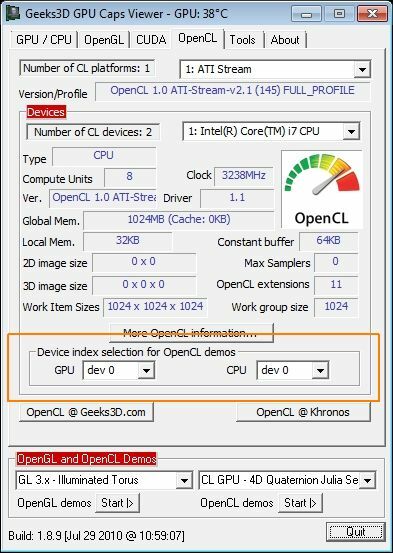 opencl device selection is perfect! The zip version is now available! So, there is one more extension supported that this version of GPU Caps Viewer doesn’t exposes. @Korvin77: there is no hardware check, if your HD 4850 / driver support OpenGL 3, then you’re ok.
@Aleksandar: thanks, I’ve completely forgotten to use the debug flag. Indeed, there are now 243 extensions with my GTX 480. The debug flag will be available in gpu caps 1.8.10. Hello, where can I find this utility for Linux?